This contribution discusses the moves between the Brussels municipalities and the Brussels periphery in Flemish Brabant. Even in the most recent period, mainly young families moved to the periphery, leading to an impoverishment of Brussels. This observation is not new, but the socio-economic profile of the movers has rarely been examined. This study does so, confirming the perception of movers having higher incomes than the Brussels average. Income variations between the destination municipalities or districts are substantial but the large majority of the movers do have work. The strong increase in the number of movers of non-Belgian origin is a notable evolution. Suburbanization is no longer a concern of middle class individuals of Belgian origin. The number of moves in the other direction is much smaller, but there exists an important commuting flow towards Brussels. This contribution highlights the work commute and the commutes in other, less documented domains: commuting to school and commuting in order to use social services. These flows also are mainly oriented towards Brussels. Deze bijdrage behandelt de verhuisbewegingen tussen de Brusselse gemeenten en de rand rond Brussel in Vlaams-Brabant. Ook in de meest recente periode zijn het vooral jonge gezinnen die naar de rand trekken, en dat gaat samen gaat met een verarming van Brussel. Dat is geen nieuwe observatie, maar het socio-economisch profiel van de verhuizers zelf is eigenlijk zelden bestudeerd. Deze studie doet dat wel en bevestigt het beeld dat de verhuizers een hoger inkomen hebben dan gemiddeld in Brussel. Er zijn wel grote inkomensverschillen tussen de (deel)gemeente van aankomst, maar de overgrote meerderheid van de verhuizers is wel aan het werk. Een opvallende evolutie is verder de sterke toename van het aantal verhuizers van niet-Belgische origine. De tijd is voorbij dat suburbanisatie uitsluitend een zaak was van de middenklasse van Belgische origine. Het aantal verhuisbewegingen in omgekeerde richting is veel kleiner, maar er bestaat wel een grote pendelstroom richting Brussel. Deze bijdrage belicht de werkpendel, maar ook de pendel op minder gedocumenteerde terreinen: schoolpendel en pendel bij gebruik van welzijnsvoorzieningen. Ook die pendelbewegingen gaan vooral in de richting van Brussel. Cet article étudie les mouvements migratoires entre les communes bruxelloises et la partie de la périphérie bruxelloise située dans le Brabant flamand. Même actuellement, ce sont surtout de jeunes familles qui partent vers la périphérie, ce qui entraîne un appauvrissement de Bruxelles. Cette constatation n’est pas nouvelle, mais le profil socio-économique des migrants eux-mêmes a été, en fait, peu étudié. Les auteurs de cet article ont approfondi cette question et en ont confirmé l’image du migrant au revenu supérieur au revenu moyen à Bruxelles. Il y a de grandes différences selon l’ancienne commune d’arrivée, mais la très grande majorité des migrants sont bel et bien actifs. Une évolution frappante est la forte augmentation du nombre de migrants d’origine non belge. Le temps est loin où la suburbanisation était l’apanage de la classe moyenne d’origine belge. Le nombre de mouvements migratoires dans l’autre sens est beaucoup plus faible, mais il existe évidemment un flux non négligeable de navetteurs vers Bruxelles. L’analyse met en lumière ces mouvements quotidiens domicile-travail, mais aussi ceux qui sont moins documentés : trajets domicile-école et trajets liés aux services d’aide sociale. Ces derniers déplacements s’effectuent surtout vers Bruxelles. 2. Migrant Profiles: Nothing New Under the Sun? 1The Brussels-Capital Region is completely surrounded by the province of Flemish Brabant. Consequently the interaction between both areas is intense and of long date. Suburbanization has been important for several decades: many young families move from the Brussels Capital Region to Flemish Brabant. As this migration often concerns higher income groups, it impoverishes the Brussels municipalities and increases the prosperity of Flemish Brabant. The number of moves in the opposite direction is much less pronounced, but there is a large commuter flow to the Brussels Capital Region. Many inhabitants of Flemish Brabant travel daily to the Brussels municipalities in order to work, but also for other social and economic activities. 2This contribution examines the extent of the structuring role the suburbanization from the Brussels municipalities is still playing in the relations between the Brussels Capital Region and Flemish Brabant, and if its content is changing. How large is the migrant group at present? Is it still mainly composed of young families? Does the nationality (at birth) of the migrants reflect the demographic evolution in the Brussels Capital Region? Are these really high income groups and what is their position on the labour market? We also explore differences between municipalities. If possible, we drill down to the level of the districts, which correspond to the old municipalities before the mergers of the 1960s and 1970s. 4This contribution focusses on the part of Flemish Brabant having the strongest interaction with the Brussels Capital Region. In a number of other municipalities in Flemish Brabant the influence of the Brussels Capital Region is indeed limited, mostly in the eastern part of the province, where the city of Louvain exerts its influence. We can read this on the map of the Brussels Capital Region drawn by Luyten & Van Hecke  (figure 1). This urban region encompasses not only the agglomeration municipalities (contiguous development from the central city outwards) but also numerous other municipalities which were added to the urban region based on several indicators: the evolution of built surface and population, the migration from and towards the city, the work and school commute and the income ratios. 5The study area includes the Flemish Brabant part of this urban region, with the addition of the municipalities Liedekerke and Affligem in the extreme west of the province (figure 1). In recent years there has been a strong migration dynamic between these two municipalities and the Brussels Capital Region. We will call this area the “large periphery”. The term “Brussels” refers to the (administrative) Brussels Capital Region, unless indicated otherwise. The Brussels urban region also comprises a number of municipalities in Walloon Brabant.2 These municipalities are not included in our study, due to a lack of source material. 6The population evolution of the large periphery is strongly influenced by the presence of Brussels (table 1). In the years from 2008 to 2012, the migration balance with Brussels (the number of migrants3 from Brussels minus the number of migrants to Brussels) was more than 33 000 individuals4, or each year almost 12 individuals per 1 000 inhabitants. By way of comparison: in the same period, natural growth (the number of births minus the number of deaths) increased the number of inhabitants of the large periphery with 4 796 people. This averages to 1.7 individuals per 1 000 inhabitants per year. 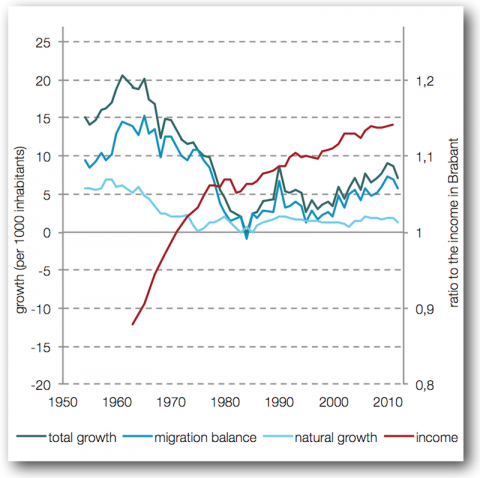 The migration balances with other Belgian regions are negative. More than 6 000 individuals move from the large periphery to the rest of Flemish Brabant rather than in the opposite direction. The migration balances with the rest of the Flemish Region and the Walloon Region are in the same order of magnitude. In the Walloon Region, the Walloon Brabant municipalities predominate. 7In the large periphery, the growth from foreign countries is limited. In the period 2008‑2012 it amounted to 4 000 individuals, representing a yearly increase of 1.5 individuals per 1 000 inhabitants. By way of comparison: in Brussels, the migration balance with foreign countries was more than 100 000 individuals. Like other regional capitals, Brussels clearly has a reception function for foreign migration. 8Although population increase in the periphery is mainly determined by the inflow from Brussels, the number of moves between and within the municipalities of the large periphery is even larger. These movements do not impact the global population of the large periphery, but do change the composition of the population of a given municipality (in the case of moves between municipalities) or a district (in the case of moves within municipalities). 9The numbers used, reflect a five year period, in order to neutralize coincidental variations between the years. Non-recurrent events, such as new real estate developments, can also have a substantial impact, most certainly on the municipal or district level. 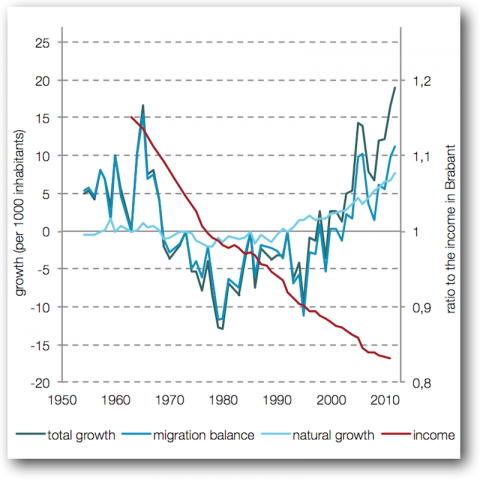 The global migration balance in the large periphery however appears to be very constant during the period under review. In the longer term, the numbers are slightly higher than in the 1980s or 1990s, but much lower than in the period predating the oil crisis. This can be observed clearly in figure 2, showing the population evolution in the large periphery in the 1954‑2012 period. 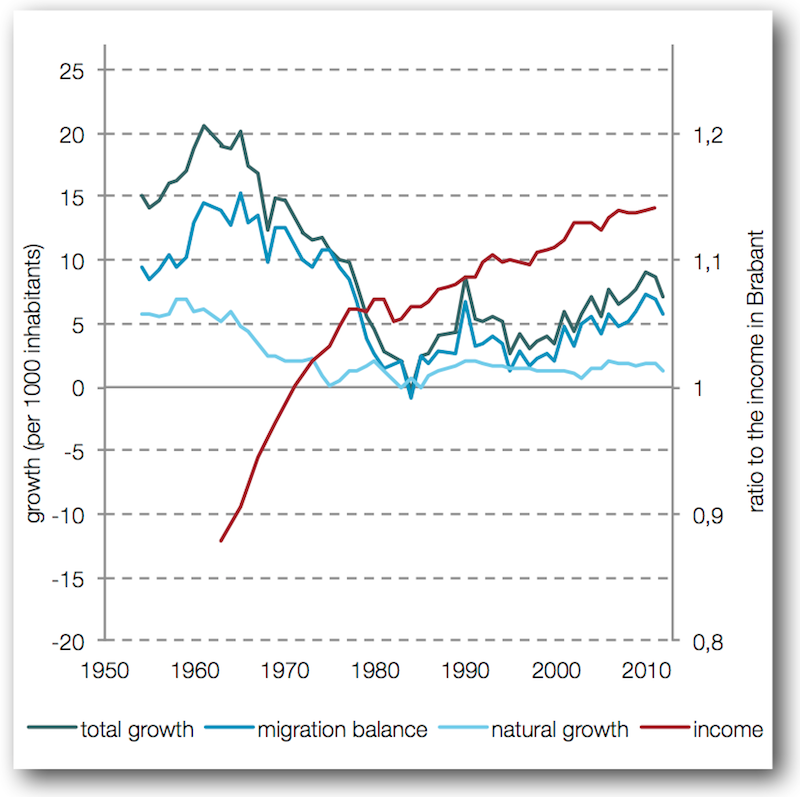 The total increase is mainly determined by the migration balance, which was much higher in the Fifties, Sixties and Seventies than in the present period. Even then the migration from Brussels was decisive [Van der Haegen, 1987]. 10Figure 2 also shows the evolution of average income (as per income statement) in relation to the average income for the entire former province of Brabant. This indicator increases continuously in the large periphery, from far below the average (<1) to markedly above the average (>1). In Brussels (figure 3) the trend is reversed – despite a continuous outflow to the periphery, the population increased in the beginning and at the end of the period under review. This can be explained by migration from foreign countries. 11The impoverishment of Brussels and the growing prosperity of the periphery suggest that mostly higher income groups are leaving the city, as observed in other studies [Loeckx et al., 2014]. The departure of mainly young families is also a classic suburbanization characteristic [Willaert, 2009]. Some recent studies have also shown that more and more individuals of non-Belgian origin are moving from Brussels [De Maesschalck, 2012]. In the following section, we will examine the migrant profiles in detail and look for changes in recent years. 13Whereas this age and family profile has been mostly stable throughout the years, a different demographic variable has changed: the nationality at birth (hereafter “origin”). In figure 5 (top) we see the net growth in the large periphery from Brussels, subdivided according to origin.6 The number of individuals of Belgian origin decreases each year and is now less than half of the total population. Most striking is the increase in Eastern European origins. 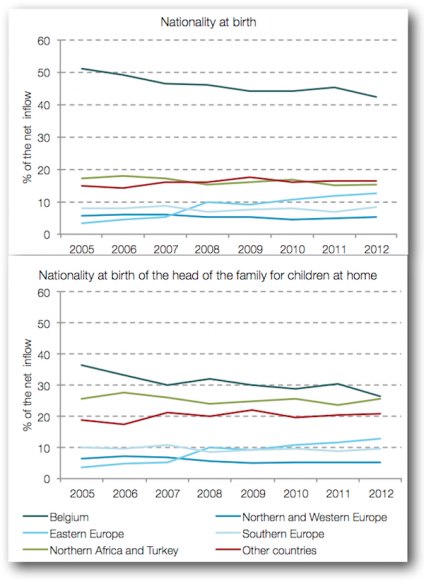 In figure 5 (bottom) children moving with their parents have been given the nationality at birth of the head of the family. This means that some children born as Belgians can be assigned a non-Belgian origin. Here also we notice a decreasing trend for individuals of Belgian origin, who now represent less than one third of the increase from Brussels. Although here also the increase of Eastern European origins is strongest, the much larger share of Northern African, Turkish and other non-EU origins is striking. These are also the nationality groups most often taking the Belgian nationality [Steunpunt sociale planning, 2010]. 14Therefore increasingly more people of non-Belgian origin are moving from Brussels, whereas the age and family positions do not change much in time. 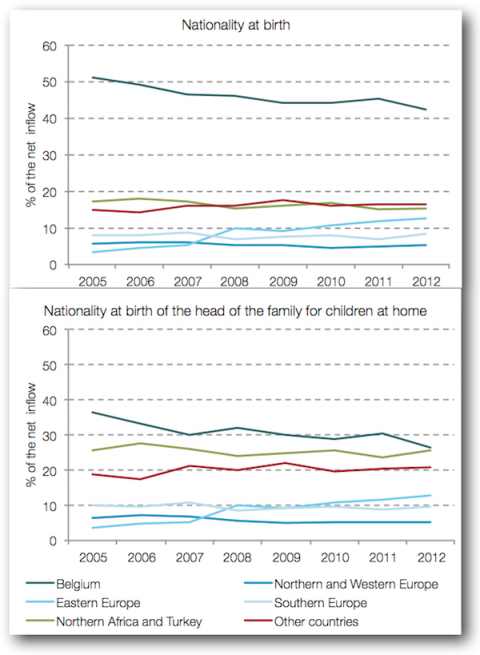 This means that the suburbanizers of non-Belgian origin fit the classic profile: mainly young families with children. 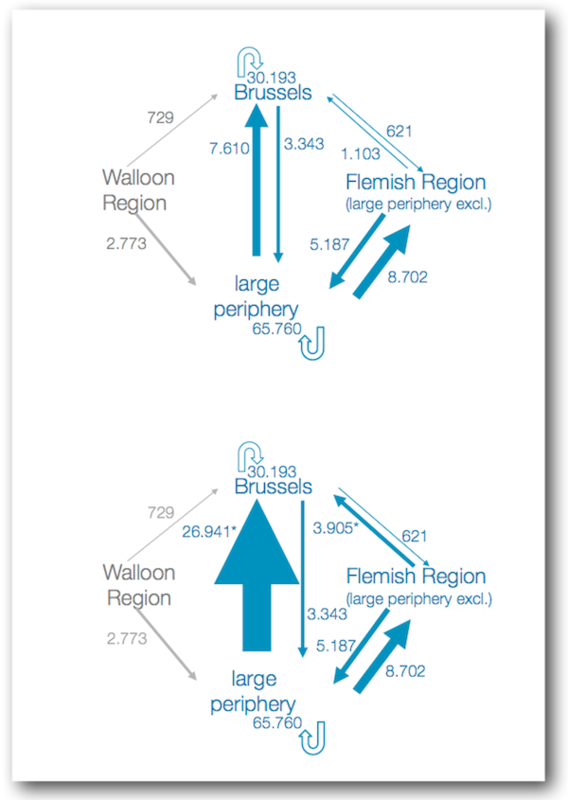 Figure 6 shows the age distribution of the net inflow from Brussels to the large periphery for various origins. We can observe that the curve is indeed similar for all groups. 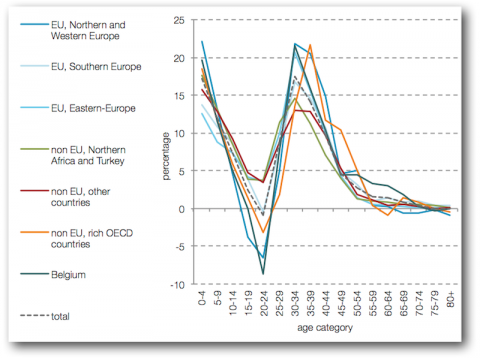 The age differences are however slightly more pronounced for the Belgian origin, the Northern and Western European origin and the non-European origin from wealthy OECD countries. 15Inhabitants of different origins do not have fundamentally different life ambitions, including the suburbanization aspiration. In the Belgian context this has not yet been specifically studied, but in other European countries it has [Clapson, 2000; Permentier & Bolt, 2006]. In Belgium, the suburbanization of migrants has long been blocked by the economic crisis of the 1970s and 1980s, which mainly hit the groups in the centre of the city [Kesteloot, 2001]. At present, suburbanization no longer appears to be a phenomenon restricted to the Belgian middle classes. The migrant’s origin more closely reflects the population composition of Brussels. 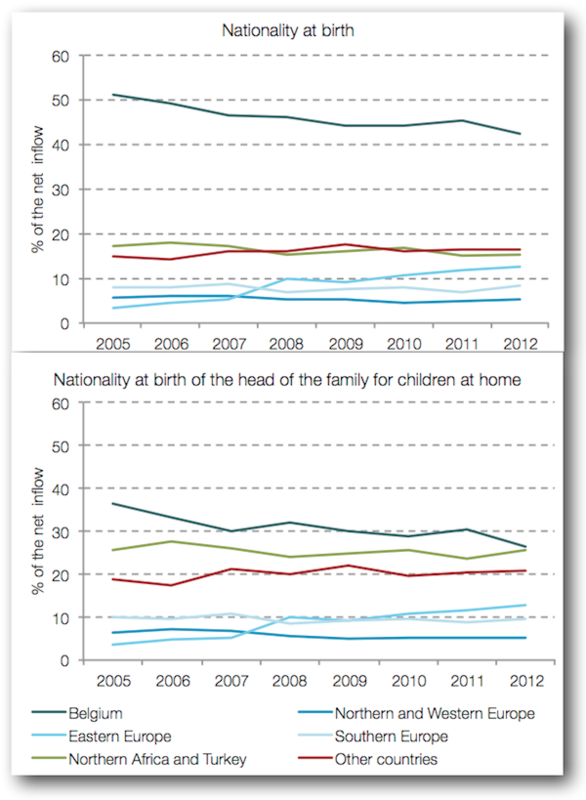 We have no detailed figures for origins in Brussels7, but nationality statistics do exist. Figure 7 shows the population composition according to nationality in Brussels, for migrants from Brussels to the large periphery, for migrants from the large periphery to Brussels and within the large periphery. Here we can see that migrants from Brussels have slightly fewer non-Belgian nationalities than the Brussels average, but that the difference is not very large. It is also notable that migrants from the large periphery to Brussels much more often have a non-Belgian nationality than the average for the large periphery - although less often than the migrants from Brussels. 16Although suburbanization evidently results in an impoverished city and a more prosperous periphery, in reality not much is known about the (evolution) of the socio-economic position of the migrants themselves. The number of studies directly mapping the socio-economic profile of migrants is extremely limited. The exceptions are some publications using data from the 2001 socio-economic survey of [Van Criekingen, 2006; Van Criekingen et al., 2013]. We have used the more recent data of the Kruispuntbank van de Sociale Zekerheid. We have divided the Belgian population in four income groups or quartiles: the 25% of inhabitants with the highest incomes, the 25% with the lowest incomes and the two quartiles in between. This concerns incomes from work and benefits; we do not have information on moveables and immoveables. It also concerns the equivalent income: all incomes of a family are added and divided by a factor taking into account the composition of the family and possible economies of scale.8 The result is allocated to each family member. 17We see the result in figure 8, illustrating the distribution over Belgian income quartiles for the inhabitants of Brussels, the migrants from Brussels to the large periphery, the inhabitants of the large periphery and the migrants from the large periphery to Brussels. The lowest income quartile is strongly overrepresented in Brussels, the reverse is the case for the highest income quartile. The profile of the migrants to the periphery does not reflect this: the lowest income group is less represented, the highest more. In the large periphery we observe the reverse. It has relatively few low income and many high income inhabitants, but for the migrants the lowest income group is the largest and the highest is the smallest. 18In figure 9 on the upper part we see the net result of these movements, the balance. This shows that mainly the highest income group grows strongly in the large periphery, while the lowest income group grows least. 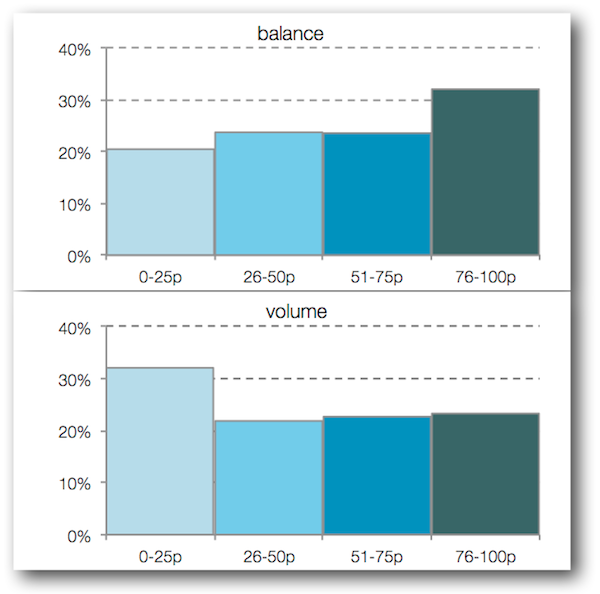 On the bottom part, the total migration volume is shown. This is the addition of all movements, both from Brussels to the large periphery and the other way around. We observe that the number of movements is much larger for the low incomes (often renters). The balance however is relatively small, as they often move to Brussels. 19Here also there are few differences in time, while we know that the share of non-Belgian individuals does increase strongly. As with the age and family position, the group of non-Belgian origin reflect the classic suburbanization pattern: mostly high incomes leave the city. The average income is higher for individuals of Belgian origin than for non-Belgian origins, with non-EU origins scoring the lowest average income. However within these groups we observe that migrants from Brussels on the average always have a higher income than the people remaining in the city. 20For the position on the labour market, we observe the same trend as for income. The migrants from Brussels number more employed and children than the average for Brussels, and fewer unemployed and inactives (benefits, disability…). On the other hand, more unemployed and inactives move to Brussels than the average for the inhabitants of the large periphery. Very few pensioners move between Brussels and the large periphery. These movements result in a strong growth in the large periphery of the employed (45%) and children (37%). For the remaining 12% the position on the labour market is not yet known. This concerns individuals without any link with Belgian social security: househusbands and housewives, EU employees and other groups not covered by Belgian social security. 21The migration balance (and the growth through migration) is especially large in the municipalities bordering Brussels and foremostly in the districts nearest Brussels. In the west, the influence extends further, reaching the border of the province. The highest values are found in the southwestern valley of the Senne (Drogenbos, Ruisbroek, Lot, Beersel), in the northeast (Machelen, Diegem, Sint-Stevens-Woluwe), and in the northwest (Strombeek-Bever, Wemmel, Zellik). In the southeast, values are somewhat lower. 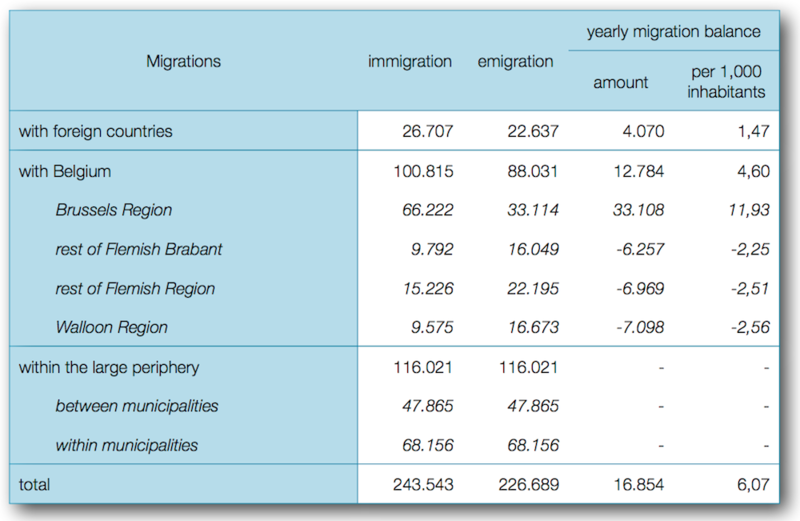 Here the exchange with Brussels is less important and the number of immigrations is often more in balance with the number of emigrations (figure 10). 22Looking at the Brussels municipality of origin, we notice very large spatial differences. Migrations indeed most often cover small distances. Figure 11 shows the migration balances for different groups of Brussels municipalities, composed according to their location. The groups in the northeast, southwest and northwest each number about 200 000 inhabitants. A fourth group is composed of the southeastern municipalities, totalling about 350 000 inhabitants. The city of Brussels itself is shown separately, because of its central location, and numbers the fewest inhabitants.9 Each time we observe that the large majority of migrants move to more or less neighbouring districts in Flemish Brabant. They are often also socio-economically and morphologically close. The housing market in the southeastern municipalities, for example, is often comparable to that on the other side of the regional border. The same goes for a number of municipalities in the valley of the Senne. 10 A linear regression gives a R² value of 0.51. 11 A linear regression gives a R² value of 0.72. 24The profile of the Brussels population varies significantly between municipalities. This also impacts the profile of the migrants and therefore the inflow in the neighbouring municipalities. It mainly concerns young families12, but there are large differences according to origin. Many individuals of Southern European origin, a significant group in the southwest of Brussels, move to the southwestern Senne valley. Many individuals of Turkish origin, strongly concentrated in the northeast of Brussels, move to the northeast Senne valley. In general few individuals of non-EU origin move to the southeast. 25We also observe large differences regarding income. Figure 12 illustrates the distribution over Belgian income quartiles of migrants per district. Whereas the southeast mainly receives higher incomes, we find many low incomes in several municipalities in the Senne valley, in the northeast and the west. This does represent an overwhelming majority of employed. 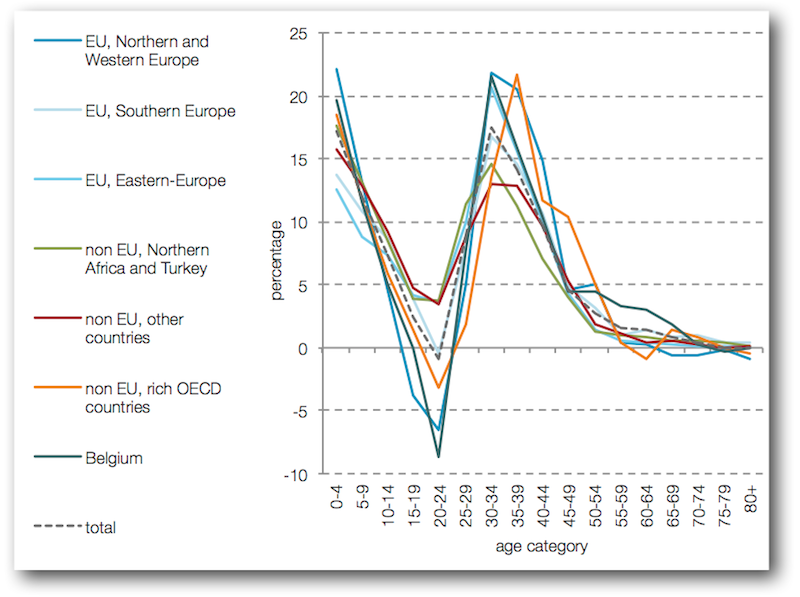 Figure 13 shows the position on the labour market of migrants of active age (excluding children, pensioners and unknown). In all municipalities it concerns almost exclusively employed. 26Brussels is by far the largest employment pool of the country, therefore attracting many commuters [Medina Lockhart & Vandermotten, 2009]. In 2011 more than 227 228 inhabitants of Brussels worked in Brussels, compared to 381 394 non-inhabitants. More than one fifth of the latter come from the large periphery (83 380 commuters). This only regards employees, as self-employed individuals are not taken into consideration. These core figures come from the Kruispuntbank van de Sociale Zekerheid, which means that foreign diplomats, EU officials and employees of NATO and other international institutions are not included. As most of these institutions are based in Brussels, the aforementioned data are a lower limit. 27The commute flow in the other direction, from Brussels to the large periphery, is limited. In 2011, 63 216 inhabitants of Brussels worked outside the city, of which 40 percent in the large periphery (25 183 commuters). The airport area in particular attracts many inhabitants of Brussels. Zaventem and Machelen are the only municipalities in the large periphery attracting more inhabitants of Brussels than the number of their inhabitants working in Brussels. Vilvoorde welcomes more employees from Brussels than Machelen in absolute figures, but has an even larger flow towards Brussels. Together with the municipalities with language facilities, Zaventem, Vilvoorde and Machelen have the largest commute volume - the sum of incoming and outgoing commuters. *Only the total number of pupils from the Flemish Region enrolled in the school system of the French Community in Brussels is known. These pupils were distributed over the large periphery and the remainder of the Flemish Region based on the distribution in the school system of the Flemish Community in Brussels (87,3% from the large periphery and 12,7% from the remainder of the Flemish Region). 29On the other hand, the number of pupils living in Flemish Brabant who commute to Brussels is decreasing slightly from year to year. The growth of the number of pupils in Brussels Dutch-speaking education is therefore entirely due to the increase of the number of Brussels pupils. The growth of the number of pupils in the large periphery can largely be explained by the increase of the number of pupils in the large periphery itself: the increase of the number of Brussels inhabitants is rather limited. 30Of course this is only part of the story. 83% of the pupils in Brussels schools is indeed enrolled in the school system of the French Community (not counting the European and international schools). For pupils living outside Brussels but visiting schools in Brussels, this is 72%. In figure 14 (bottom), the Brussels French-speaking schools are added. The flow from Brussels to the large periphery stays the same – as the French Community does not organise education in the periphery – but the flow in reverse now counts almost 27 000 pupils. This results in a net flow of almost 24 000 in the direction of Brussels. In most municipalities with facilities, a majority of pupils is enrolled in French-speaking schools. 14 In Brussels this is 31%, in the large periphery 36% and in the Flemish Region 40%. 32In various others social services we also observe, in the Dutch-speaking offer, a flow towards Brussels, often combined with a limited offer. The Centra voor Algemeen Welzijnswerk (CAW), subsidized by Flanders, are an example of this phenomenon. Figure 16 shows the domicile of the clients of Brussels CAWs and the CAWs of Flemish Brabant. For the latter, a distinction was made between the establishments in the large periphery and in the rest of Flemish Brabant. 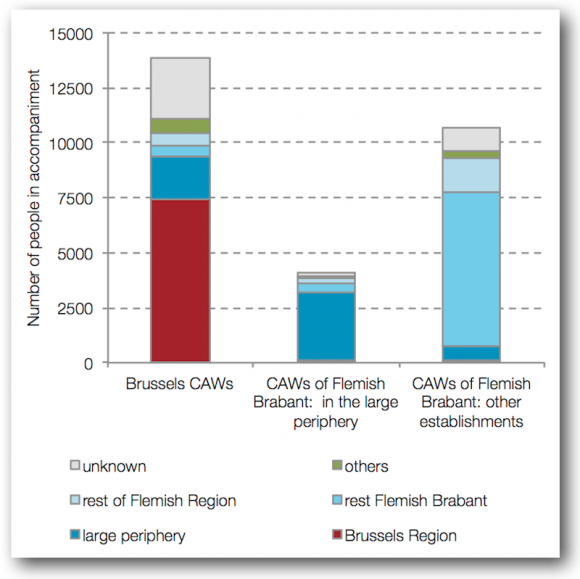 We observe that many inhabitants of the large periphery are being assisted in Brussels, but that the number of inhabitants of Brussels with CAWs in Flemish Brabant is very small, both in the large periphery as elsewhere. This is partly due to the specialized offer in Brussels in the period reviewed, but even without this offer we find a net flow towards Brussels. This coincides with a very limited offer in the large periphery. 33The population growth in the Brussels periphery is primarily determined by migration from Brussels. This often concers young families, as has been the case during the previous decades. This suburbanization impoverishes the city and makes the large periphery more prosperous. This observation is not new, but the socio-economic profile of the migrants has hardly been studied. This study has done so and confirms the image of the migrant having a higher income than the Brussels average, although this does not apply to all districts and municipalities of the large periphery. The observation that the large majority of migrants is active on the labour market however applies to all municipalities. It is also notable that this more often concerns individuals of non-Belgian origin. Whereas for many years suburbanization was almost exclusively limited to middle class people of Belgian origin, this no longer applies. More than previously the migrants from Brussels reflect the composition of the Brussels population, at least in this regard. In the group of non-Belgian origin, young families and higher income groups are also overrepresented. 34This continuous inflow into the large periphery is contrasted by a daily commute flow towards Brussels, for work, child care and numerous other social services. The evolution of these movements is not unequivocal and requires much additional research. The growing Brussels employment is increasingly taken up by inhabitants of Brussels itself, while commuting remains relatively constant. We have previously seen that the number of pupils from the large periphery following Brussels Dutch-speaking education is decreasing, while it strongly grows in the periphery. Does this mean that the inhabitants of the periphery and especially the migrants from Brussels are less focussed on Brussels than in the past? Or can it not be separated from the capacity problems in Brussels schools [Wayens et al., 2013]? The limited offer of social services in Flemish Brabant also influences the movements towards Brussels. It is however difficult to judge if an expansion of the social offer in the large periphery, which is presently far below the Flemish average, would indeed decrease these movements. 35As this publication maps the movements between Brussels and the larger periphery, it requires some qualifications. Brussels itself experiences a suburbanization movement from the central to the peripheral municipalities, as the city’s administrative borders do not coincide with its social borders. 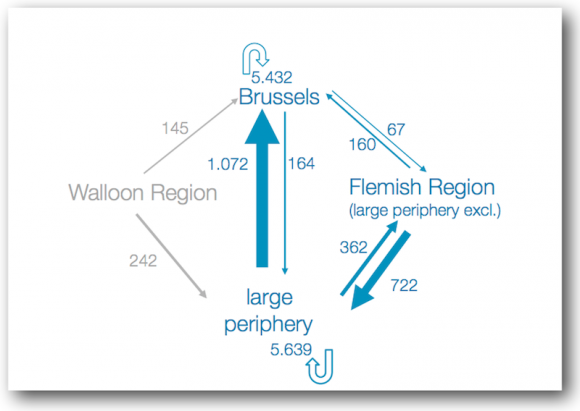 The differences between Brussels and the larger periphery are often more significant than those between neighbouring areas in Brussels and the larger periphery. This is shown for instance on figure 17, illustrating the number of pupils (in the schools of the Flemish Community) receiving scholarships because of low income. We notice higher values in the valley of the Senne, from Halle through Brussels up to and including Vilvoorde, whereas the east and southeast of Brussels approach the low values of the (south)eastern periphery. We have also seen that the migration movements between the southeast of Brussels and the neighbouring areas in Flemish Brabant mainly concern high incomes, which does not always hold true for other areas. This also we must keep in mind: an administrative border is not a real social border. CLAPSON, M. 2000. The suburban aspiration in England since 1919. In: Contemporary British History, Vol. 14, No. 1, pp. 151‑174. DE MAESSCHALCK, F., 2012. De internationalisering van de rand: een demografische blik, In: DEGADT J., DE METSENAERE, M., DE VLIEGER, M., JANSSENS, R., MARES, A. & VAN WYNSBERGHE, C. (red.). De internationalisering van de Vlaamse rand rond Brussel. Brussels. ASP, pp. 25‑43. DE MAESSCHALCK, F., DE RIJCK, T. & HEYLEN, V., 2014. Dossier wisselwerking Vlaams-Brabant en Brussel, Louvain. Steunpunt sociale planning, 110 p.
KESTELOOT, C., 2001. Verstedelijking in Vlaanderen: problemen, kansen en uitdagingen voor het beleid in de 21e eeuw. In: DE RYNCK, F. (red. ), De eeuw van de stad. Over stadsrepublieken en rastersteden. Voorstudies. Brussels. Ministry of the Flemish Community, pp. 15‑83. LOECKX, A., OOSTERLYNCK, S. & KESTELOOT, C., 2014. Wat met Brussel? Louvain. LannooCampus, 148 p.
LUYTEN, S. & VAN HECKE, E., 2007. De Belgische stadsgewesten 2001. In: Statistics Belgium Working Paper, 81 p.
MEDINA LOCKHART, P. & VANDERMOTTEN, C., 2009. Les Bassins d’emploi en Belgique (II). In: Conférence Permanente du Développement Territorial (CPDT), Atlas des dynamiques territoriales. 4 p.
PERMENTIER, M. & BOLT, G., 2006. Woonwensen van allochtonen. In: DWG/NETHUR Partnerschip, No. 37, 81 p.
STEUNPUNT SOCIALE PLANNING, 2010. Dossier minderheden in Vlaams Brabant 2010. Louvain. Steunpunt sociale planning, 118 p.
THOMAS, I., COTTEELS, C., JONES, J. & PEETERS, D., 2012. 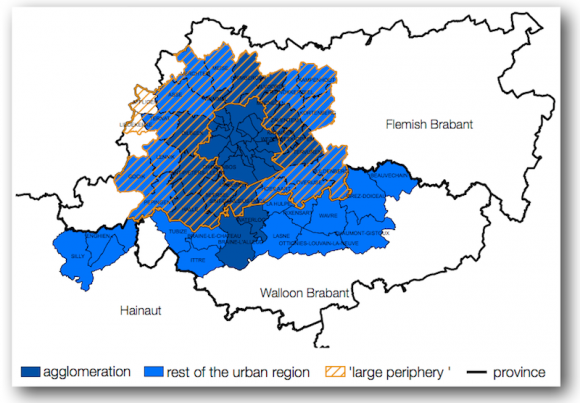 Revisiting the extension of the Brussels urban agglomeration: new methods, new data… new results? In: Belgeo, 1‑2 (2012), 12 p.
VAN CRIEKINGEN, M., DE KEERSMAECKER, M.-L., MARISSAL, P., VAN HAMME, G., HAROU, R. 2013. Entre relégation et risques de gentrification: étude des recompositions territoriales et démographiques des villes Wallonnes et de leurs impacts sociaux. In: Conférence Permanente du Développement Territorial (CPDT), Rapport Final. 99 p.
VAN DER HAEGEN, H., 1987. De uitgeholde stad. In: KNOPS, G. (red.). De uitgeholde stad. Brussels. King Baudoin Foundation, pp. 11‑29. WILLAERT D., 2009. Verhuisbewegingen vanuit en naar de Vlaamse Rand rond Brussel. In: Interface Demography Working Paper. 2009‑5, 23 p.
1 This article is based on “Dossier Wisselwerking Flemish Brabant en Brussels”, a study of the Steunpunt sociale planning of the province of Flemish Brabant [De Maesschalck, De Rijck & Heylen, 2014]. 2 This also appears from other studies mapping the urban area surrounding Brussels, for example the study by Thomas et al. .
3 A move or migration is defined as a change of (official) domicile between two consecutive years, each time on January 1st. Persons moving several times in a single year are counted only once, each time referring to their domicile on January 1st. 4 The migration balance between Brussels and the province of Flemish Brabant as a whole is not much larger: 34 981 persons. More than 90% of the movements between Brussels and Flemish Brabant occur between Brussels and the large periphery. 5 Strikingly, female migrants are on the average younger than males and strongly concentrated in a number of age groups. Migrants are often couples, with the woman on the average younger than the man. One also notices that relatively more women move from than to Brussels. 16 557 men and 16 839 women move to Brussels, but 32 529 men and 33 693 women leave. In this way, migration to the periphery could partially explain the observation that the number of men in Brussels in recent years has been increasing faster than the number of women - in contrast with the large periphery (and the Flemish Region as a whole). There are also other explanations: the changing age structure (the Brussels population is growing younger, in contrast to the large periphery and the entire Flemish Region, and the predominance of women is larger in the older age groups), and the significant foreign immigration (in which men predominate). 6 A subdivision has been made between Belgium, other countries of the EU (divided in three groups: Northern and Western Europe, Southern Europe and Eastern Europe) and non-EU countries (divided in two groups: Northern Africa and Turkey and other countries). In some figures, these groups have been further subdivided (cfr. Steunpunt sociale planning, 2010, p. 12, for explanations). 7 Deboosere et al. calculated that 46% of the inhabitants of Brussels had a non-Belgian nationality at birth. If we add the children born here as Belgians from parents not born as Belgians, this becomes more than 50%. 8 The reference individual gets a value of 1, each extra family member of 14 years of age or older a value of 0.5, each child a value of 0.3. 9 The city of Brussels numbers 166 497 inhabitants, the north-eastern municipalities 191 890 inhabitants, the north-western municipalities 209 673 inhabitants, the southwestern municipalities 214 083 inhabitants and the southeastern municipalities 356 711 inhabitants. 12 Only for the group of 18‑29 years olds there are large spatial differences: in the southeastern periphery the balances are negative, while they are (slightly) positive in most other neighbouring districts. This is explained by a combination of a limited inflow and a relatively large outflow. 13 Wemmel, Lennik and Drogenbos do have a relatively large inflow from Brussels in primary education, leading to a positive balance for primary and secondary education together. In Lennik this primarily concerns schools for children with special needs. Filip de Maesschalck is Doctor of Geography and researcher with the Steunpunt sociale planning of the province of Flemish Brabant. A recent publication from the Steunpunt is “De internationalisering van de rand: een demografische blik” in “De internationalisering van de Vlaamse rand rond Brussel” . He is also attached to the Geography Department of the KU Leuven, often working on the subject of political geography. A recent publication in this field is “Hoe representatief is Michel I” in the journal Samenleving en Politiek. Tine De Rijck is Master of Geography and researcher with the Steunpunt sociale planning of the province of Flemish Brabant. She previously worked at the Geography Department of the KU Leuven on the subject of social exclusion. Vicky Heylen is commercial engineer and researcher with the Steunpunt sociale planning of the province of Flemish Brabant. She previously worked at the HIVA (KU Leuven) on the subject of labour market evaluation.